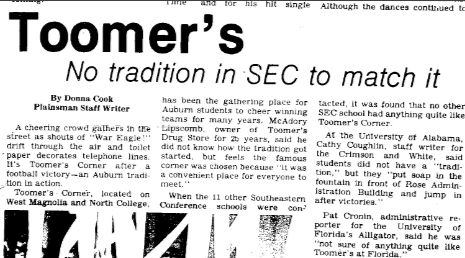 The Plainsman‘s attempt to prove in its November 7, 1977 issue that the rolling of Toomer’s Corner was the most unique tradition in the SEC had a semi-sense of urgency to it. Six weeks earlier, the paper had bemoaned the possible end of the rollings due to downtown renovation. A cheering crowd gathers in the street as shouts of “War Eagle!” drift through the air and toilet paper decorates telephone lines. It’s Toomer’s Corner after a football victory—an Auburn tradition in action. When the 11 other Southeastern Conference schools were contacted, it was found that no other SEC school had anything quite like Toomer’s Corner. Man, there’s some rich irony there: The (almost certainly) first blip of Paul Finebaum on the Auburn radar— the (almost certainly) first reference to the ringmaster of the six month circus surrounding the poisoning of the Toomer’s oaks in any Alabama media outlet—came 34 years ago… in a story dedicated to preserving the tradition of rolling Toomer’s Corner. Related: Did Auburn students roll Toomer’s Corner after Bear Bryant’s death? There were 11 other SEC schools in 1977? I bet Ga Tech and Tulane were contacted as well since the premise was traditions and they might have some knowledge nobody else had. Although, that means the OTHER founding member, Sawanee, wasn’t contacted. I guess that’s what you get for being the 3rd tiger in a 2 tiger conference..